Work to stabilise the embankment on the northbound A19 at the A1027 junction near Norton, Stockton-on-Tees will begin next week. We will be carrying out essential re-modelling and strengthening work to restore stability to the earthwork slope next to the A19 northbound carriageway. The slope is located between the two bridges over the A19 at the A1027 junction. Once this work is complete we will return to the site to replant trees and shrubs this autumn. The work will begin on 30 June and take place until the end of August. Work will take place Monday to Saturday, 8am to 6pm. A 50mph speed limit and narrow lanes will be in place on the northbound A19 between the A1027 exit slip road and the A1027 entry slip road. 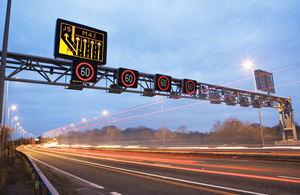 The speed restriction and narrow lanes will be in place 24 hours a day, seven days a week.